ARMN: What about you, Stumpy? You’ve been an Arlington resident for several decades now. What’s your story? How did you come to live at Long Branch Nature Center? Do you have a job there? Stumpy: My story goes back before most of my fan club were even born. I was here before Alonso was even here! [Note: Alonso Abugattas was the former acting director of Long Branch Nature Center and now is Arlington County’s natural resources manager.] I like to think I’m his superior. But before coming to Long Branch, I was just your typical box turtle in a suburban world. Then I got injured; I don’t remember how, it was really traumatic. I lost my left front leg! But luckily I was found and brought to Long Branch to get help. A turtle needs both its front legs in order to properly dig deep enough to hibernate. Luckily, they actually offered me a lifetime job. I’ve been at the nature center ever since. I do birthday parties, programs, and special events like the Turtle Trot. Turns out that this was my true calling. I’m the face of box turtles everywhere and I take that job really seriously. I was the one who really put Long Branch Nature Center on the map. Talent like this doesn’t come around often. ARMN: So the turtle rehab work they do at Long Branch is a really big deal? What are the ways the staff and volunteers help turtles and other wildlife? Stumpy: I think turtle rehabilitation is the biggest deal there is! I owe my life to Long Branch for taking care of me. And since I’ve been here I’ve seen them help hundreds of turtles. As strong as our shells are, they are no match for automobiles, lawnmowers, and even the persistent gnawing of a dog’s teeth. At Long Branch, they make sure sick and injured turtles get the medications they need and keep track of their progress. The volunteers love to get involved in turtle care. I like that a lot. I think it keeps the spirits of the injured turtles up and motivates them to get better. They give them great food, baths, and clean the tanks multiple times a week. But they not only take care of turtles, I’ve seen them care for snakes, too! They are really dedicated and attentive to their needs. It’s a labor of love for the naturalists and the volunteers, and I think the injured wildlife appreciate it. When the wildlife is ready to go, they take the animals back to their home ranges. That’s really important for a turtle––we belong in the wild and we shouldn’t be kept as pets. ARMN: Now let’s talk about this Turtle Trot on May 17. What is it and what are the details we need to know? In my opinion, what better way to spend your Saturday morning than with a good run or walk and some good turtle races! Long Branch really makes this a special event by having things to do after the race, too. I plan on crushing the other turtles in the turtle races! We are looking forward to seeing everyone there. ARMN: Finally, Stumpy, what is the one thing you’d like to be the takeaway for readers of this interview? Stumpy: Please…as if it isn’t obvious––Come out for the Turtle Trot on May 17. You don’t have to be a turtle to participate! 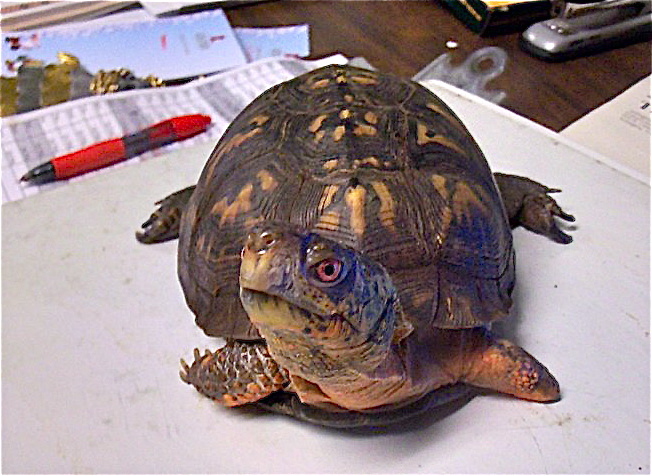 This entry was posted in Events, Long Branch Nature Center, News, Outreach and tagged long branch nature center, Turtle Trot by howellch. Bookmark the permalink.